Gorgeously presented in a vivid art-deco dust jacket, this profusely illustrated work is a nicely put together study of the ornate shop signs and enigmatic symbols from 1926, explaining the customs and tradition they are based on. Illustrated by Kent Crane with 49 photographs and full colour plates, depicting different symbols and signs, all brightly coloured, some heightened in gold, and including two large folding coloured plates. Organised to show how each group of symbols applies to life - The Inner Man; The Outer Man; His Occupation; His Funds; His General Needs; His Health; and His Future State. The story of the colourful, dramatic, and tragic life of Kwang Hsu, taken from his parents at the age of four to be placed as Emperor on a puppet throne, handsome, attractive, diligent as he grew into a realisation of his potential power, loving no one save the concubine Pearl, dying at the age of 37 at the hand of his aunt, the relentless Empress Dowager Cixi, a day before her own death. Princess Der Ling herself had served as first lady-in-waiting to Empress Dowager Cixi. ‘Princess’ Der Ling - daughter of a Manchu aristocrat, granddaughter of a Boston merchant, educated like a boy in the Confucian classics, a baptised Catholic blessed by the hand of Pope Leo XIII, a woman who donned chic Western fashions in China and her ceremonial court robes in the United States, and wife of an American soldier of fortune... Der Ling was a fascinating human battleground of warring identities, a victim of the hallucinogenic effects of too much publicity, much of it prompted by Der Ling herself, and a figure whose life provides a glimpse into one woman’s experience of living not just between two cultures—that of China and the West—but among many worlds: social, religious, moral, political. - Grant Hayter-Menzies author of Imperial Masquerade, the Legend of Princess Der Ling. Boldly signed by Donnelly on the front free endpaper. A wonderful account of voyages on China’s coast and waterways, Profusely illustrated throughout with Donnelly’s charming line sketches, six wonderful full page colour plates from water colours, and nine maps. With a poem by Joan Power at the end of each section. Chapters on the Gulf of Pechili, Taku Bar, the Yellow Sea, the Yangtze estuary, the Chusan archipelago, and the South China Sea. 1738-1741 - Printed by T. Gardner...for Edward Cave, London - First folio edition in English. 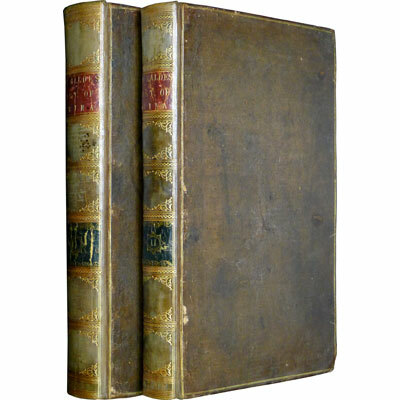 Two large folio volumes in contemporary bindings, housed in separate cloth slipcases. One of the most celebrated of all 18th century works on China, illustrated with 64 engraved plates, including D’Anville’s exceptional maps (42 large maps most engraved by Bowen), 9 city and temple plans, and 13 full-page plates depicting dress, customs and ceremonies. With exquisitely engraved headpieces and initial letters. With 21 black and white photographic plates and folding map. Lt.-Colonel Fisher’s three years of service, are in Canton, the Pei-Ho River, and Taku Fort battles, throughout the the Second Opium War. Illustrated with three wood-engraved plates, engraved plan, six in-text engravings and three folding maps at rear. Lt-Colonel Fisher begins his tales with the action at the Battle of Canton in late 1857, he remains in Canton, occupying his spare time with various adventures and sport (Cricket in Hong Kong, shooting snipe and riding ponies across the Canton countryside ‘Paper-Hunt’ style), and visits to Hong Kong and islands. Fisher then moves up the Pei-Ho River and is involved with the battles around the Taku Forts, as well as surveying the ‘Great Wall’, returning once again to the skirmishes on the Pei-Ho and around Canton. After the third and final ‘Battle of Taku Forts’ at the end of August 1860, Fisher is preparing to head to Peking but is taken sick and forced to spend two months on the hospital ship ‘Mauritius’ whilst hearing news from other wounded officers of the battles around Peking and the looting of the Summer Palace. In November of 1860 Fisher’s service in China ends with his shipment back to England.